The Skjærhalden Harbour is the pulsating center of Hvaler in summer. The famous red warehouses entice you with their versatile restaurants. Seafarers and landlubbers alike feel comfortable in the crowded street. Kirkøy is Hvaler's largest island, and the "capital" Skjærhalden is located here with all its shops and restaurants and with Hvaler's largest marina. On Kirkøy you can walk on a marked trail through varied nature with a wind-swept old forest, sandy beaches and polished rocks. You can start from the National Park Center in Skjærhalden and follow the coastal trail to the protected lighthouse Homlungen. The trail runs through some rugged terrain to the beach at Storesand, which is one of the best sandy beaches in the country. A beach cafe here is open during the summer. The island is otherwise characterized by rustic and tiny settlements here and there, often with farms and agriculture in the surrounding landscape. Here is also a golf course. 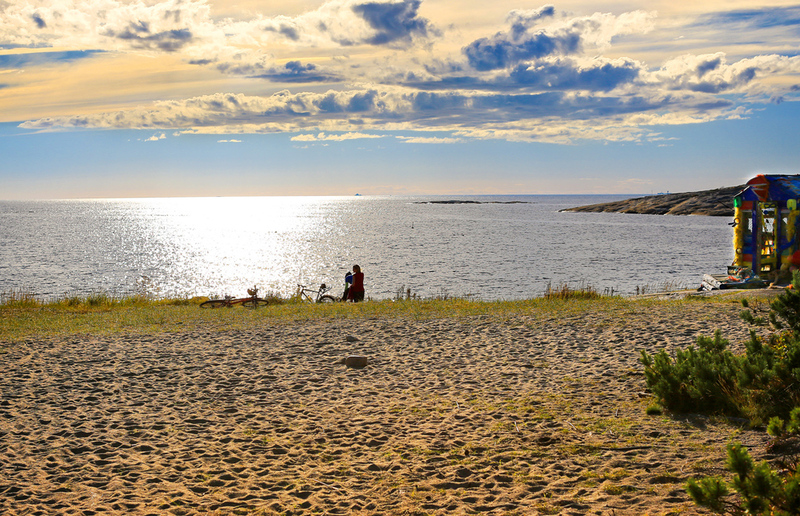 You can stay at Hvaler Gjestgiveri (Guest House), rental cabins, and you are free to find your own tent sites according to the Public Rights Act. Kirkøy is Hvaler's largest island, and the "capital" Skjærhalden is located here with all its shops and restaurants and with Hvaler's largest marina. Storesand is Østfold's finest swimming beach. Kirkøy is the last of the Hvaler islands which can be reached without boat or ferry. The island is named after the impressive stone church – probably one of the oldest in the country. Less known to most people is that Hvaler's largest island has had malaria outbreaks and that it has several oases with a rich fauna and flora. You will discover that Kirkøy is a honey pot of rare habitats if you visit the triangular area Hvaler church - Storesand - Arekilen. One of the most exciting areas to visit on Kirkøy is Hvaler Prestegårdsskog nature reserve. This woodland is easy to find with Hvaler church as a starting point when you arrive at Kirkøy via the Hvaler tunnel. When you have the church on your left hand side, Hvaler Prestegårdsskog is on your right. Storesand is not just a beach; it is also an area with a peculiar botany. Rare insects inhabit this place. Altogether 125 different plant species have been recorded in the coastal areas of Storesand. Along the seaside, beach slam grows, as well as marram grass and Leymus arenarius. A few meters from the beach you will find, among other things, bluegrass, dog grass, Hawkweed, mark wormwood, yarrow, bird's-foot trefoil, and silver cinquefoil. Many people use the beach and surroundings at Storesand which is easily seen. In some parts, the vegetation shows slight wear at the head of Døvik which, among other things, grows creeping bentgrass, reeds, and glaux. Also an unusual salt solution is found here. More rare and red-listed species of lichens are also found in the area. On Storesand, there are also several rare insect species. Bore beetle and shadow beetles have its only known habitat in Norway in this location. In addition, approximately 20 other rare beetles are found here. Many of the beetle species are associated with sandy beaches, meadows, and dry ground. In habitats such as dry meadows, including sandy areas and grasslands, contain many rare butterflies. In the area around Storesand there have been 15 rare species found. Many of these are on the Norwegian Red List - for example Archanara dissoluta. On Storesand, we find insect groups such as spider wasps, bees, Diptera, Hemiptera, and Psocoptera. This is a very rare species. Outside the reed swamp the black alder forest dominates, which is in fact the nation's largest. When you drive out of the Hvaler tunnel on Kirkøy, you pass a road to the left and just after this on the left side of the road is Arekilen nature reserve (see the map below). The area is naturally a very interesting area for botanists, ornithologists, and frankly all nature lovers. There are malaria mosquitoes here and there have been outbreaks of malaria here, but it has been over 150 years since. Outside the reed swamp the black alder forest dominates, which is in fact the nation's largest. Towards the southeastern parts of the reserve are birch and spruce more prominent. The area is traversed by any drainage ditches from cropland. On the drier, more upland areas in the northern and southwestern parts of the reserve, the pine forest dominates. Moose, deer, hares, squirrels, rodents, Eurasian water shrew, red foxes, badgers, and weasels can be observed within the reserve. The bird life in the area is very diverse and species-rich, especially in the black alder forest. Adjacent to the pond and reed beds, there are many species of wetland birds. Arekilen is an established area for southeastern bird species which is moving northward. The common reptiles are registered in the area. In particular, there is a large population of adders. Of amphibians you can find toads and pointed-snout frogs. Several attempts have been made to reclaim Arekilen. At the beginning of the last century, planning of a major reclamation project to acquire more farmland began. A wind turbine plant was built as well as a channel by Arekilen’s outlet. The windmill drove a screw, "Archimedes' screw" which would "turn" the water out of the pond at the outlet to the south. Agricultural engineer Langballe was responsible for the project and in 1916 Arekilen was drained. However, the dams broke and the water flowed again. The project was then given up. "Archimedes' screw" was restored in 1985 and now again in the original concrete foundation by Arekilen’s outlet. The beautiful Marsh Helleborine. Epipactis palustris on latin and is a strong endangered orchid. Kirkøy - A much loved island, famous for its scenic nature.